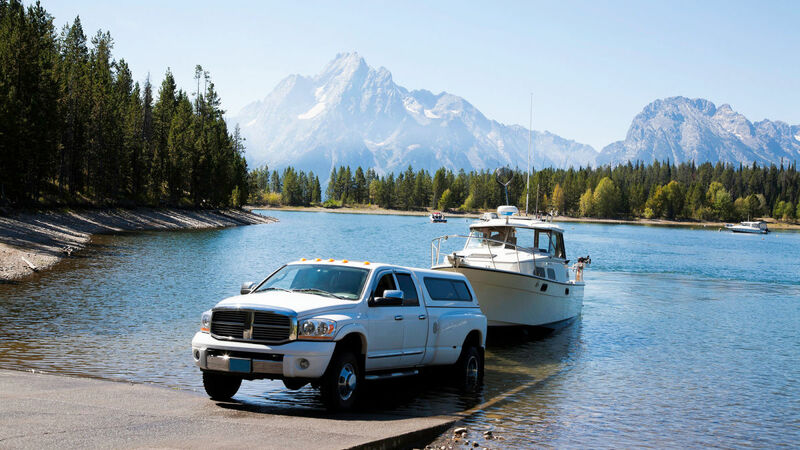 Outboard-powered trailerable cruisers give owners the freedom to pick up and go from coast to coast. Demand for trailerable boats has caught fire over the last decade, and boatbuilders have answered the call with a wide variety of solutions. Though designed with a common objective, the solutions vary greatly in how they address the needs of a portable market. 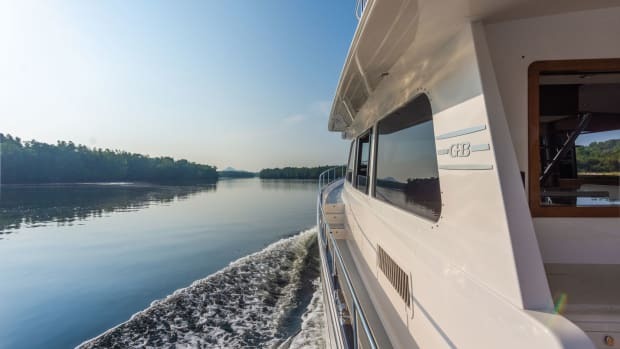 Conceived to take a cruising couple on waterborne adventures, these trailerable boats are a natural fit in the world of trawlers, but in a different fashion. Traveling is at the core, but the question is how far, how fast, and how long. Here are six capable cruisers you can strap down and take with you this summer. When I first wrote about this boat in 2012, the Acadia 25 was only offered as a diesel. But I was taken with her simplicity and rugged Downeast styling. 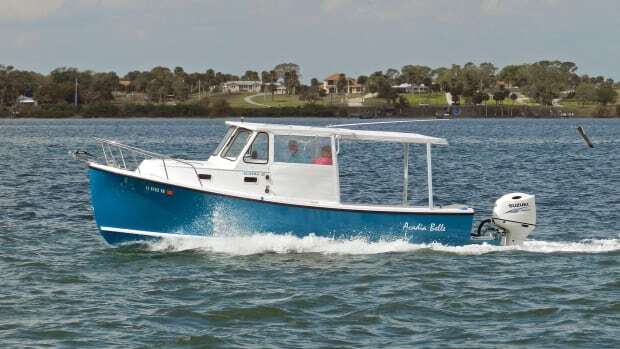 Atlas Boat Works owner Tom Gamso and his family have been building boats on the west coast of Florida since 1987, and the Acadia 25 has been one of their most popular models, with more than 120 hulls built to date. Prompted by the increasing popularity of four-stroke outboards, the company introduced its first outboard model less than a year ago. “The more stringent emission regulations on diesels have also substantially increased the cost of small diesel engines,” Gamso says. He has only built two Acadia 25 outboards thus far, and one of them was nearby on Siesta Key: Liberty, owned by Mark and Jackie Barry. Lit by the morning sun, she gleamed in her lift behind their home. Her hull was painted with Awlgrip “Boston Whaler Blue,” picked by Jackie. Prompted by the increasing popularity of four-stroke outboards, [Atlas Boat Works] introduced its first outboard model less than a year ago. Avid boaters all of their lives in New York, the Barrys’ last boat was a 46-foot cruiser. 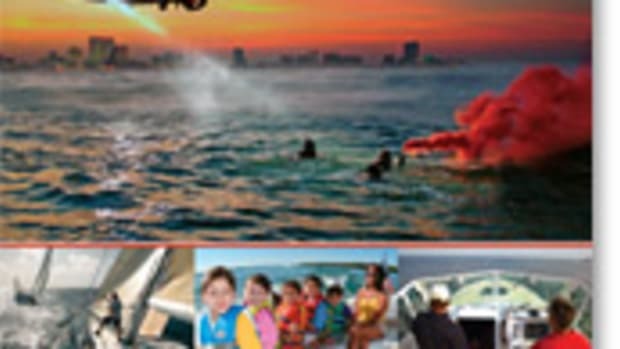 Now in Florida, they were interested in more simplified cruising from Tampa to Key West. With a plethora of marinas, restaurants, and attractions to visit by boat, their primary needs were simplicity, ease of service and airflow. 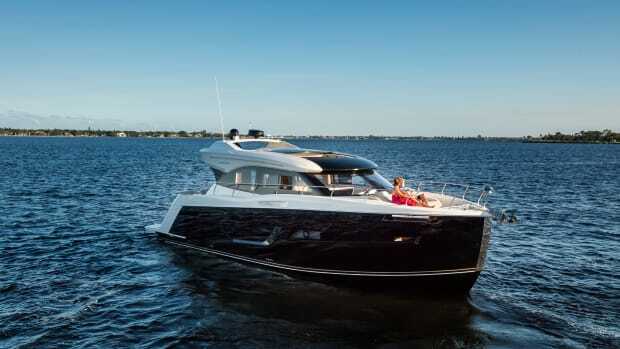 The Acadia 25 is made with open sides in the cockpit area, which are covered with a canvas awning over the aft deck stretched over a custom stainless steel frame. Between her color, her simplicity, her 26-inch draft, and her size, she’s their perfect boat for the west coast of Florida. With a 200-horsepower Suzuki four-stroke, she is capable of almost 30 knots, and her semi-displacement hull lets her cruise comfortably over a wide range of speeds. Mark finds 18 knots at 3800 rpm to be her sweet spot for fast cruising, and her most economical speed is 7 knots at 1600 rpm. While the Barrys have no plans for longer trips right now, they’re considering other great places they might like to cruise—using a trailer and expressway to get there. The four-lane Route 19 along Florida’s west coast passes through Crystal River, where I met Three Rivers Marine Owner Mike Shotwell, a C-Dory dealer, to see the new C-Dory 25. 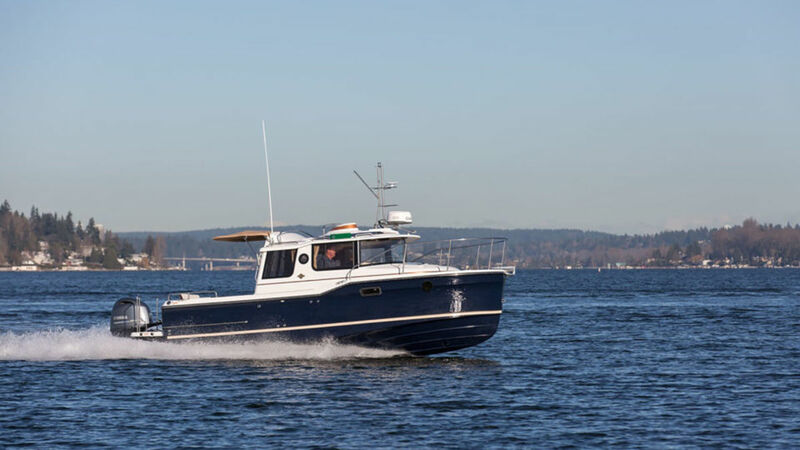 With a combination of low freeboard, a discreet cabin, and molded lapstrake hull detail, the C-Dory 25 ranks among the most attractive trailerable trawlers out there. Though built in Bellingham, Washington, she’d look just as natural cruising the fjords of Norway. In contrast to the exterior, the textured white gel coat interior finish is rather plain in appearance, but it’s practical and easy to keep clean. Exposed wiring runs and soft flexible covers over much of the onboard equipment suggest a simple approach that should appeal to anyone who appreciate access over aesthetics. 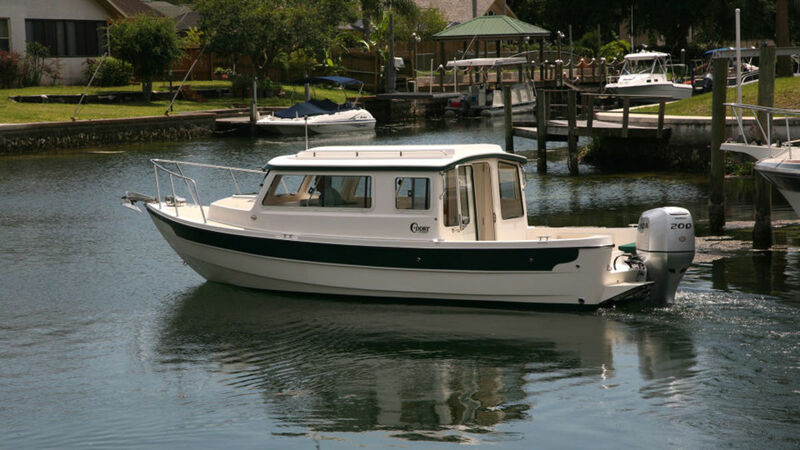 The C-Dory 25 ranks among the most attractive trailerable trawlers out there. Though built in Washington, she’d look just as natural cruising the fjords of Norway. The interior has a fully enclosed head and shower in the main cabin. Because the head has large windows fore and aft to provide visibility from the helm station, it does not feel intrusive. To maximize headroom in the main cabin, the carpeted cabin sole is literally the top surface of the hull structure, which somewhat compromises the acoustics when running. The forward cabin is enclosed by a sliding curtain, which can be a bit tricky to negotiate at first, owing to the low headroom of the opening. A diesel stove in the galley doubles as a cabin heater, which will be appreciated in colder cruising climes, and its separate fuel tank is easy to access for refills. The 200-horsepower Suzuki lives in a well, which makes for a smallish aft deck. We eased the C-Dory 25 off the dock and cruised quietly down the no-wake canals, a haven for manatees in the area. In open water, the C-Dory 25 accelerated quickly from displacement mode to full plane. Going to windward through a stiff chop, the interior decibel readings were in the 80 dbA range. (C-Dory has recently introduced its new Venture Series with a deeper V hull and an isolated floor that I suspect will run quieter.) My GPS readings verified speeds from 4.5 knots at 1000 rpm up to 22 knots at 4000 rpm. The C-Dory website has full test data for a C-Dory 25 equipped with a smaller (150-horsepower) motor and claims impressive economy over a wide range of speeds, with an average of about 3.5 miles per gallon. In the heart of Cortez, Florida, one of the last commercial fishing villages in the state and home to the local Eastern Boats dealer, the only Eastern boat in sight was a well-used commercial fishing model. She looked right at home surrounded by the fleet of commercial fishing boats outside the office of Frank Joseph, president of Grand Slam Yacht Sales. “I really don’t have a new boat in stock to show you,” Joseph said. “They’ve all been sold and we are waiting for our next orders to arrive.” Same old story. Fortunately, Maurice Blais, a service customer, had his Eastern 248 docked nearby and was happy for me to take a look at the boat. MoJo, which Blais bought in Maine, is several years old. He moves the boat back and forth between his Florida and Maine residences, trailering it behind his motor home. “I’m totally in love with my boat,” Blais said. 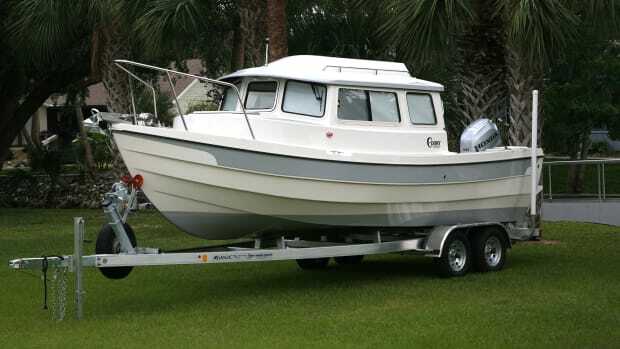 “[She’s equally] at home in the northern Atlantic or the Gulf of Mexico.” According to Blais, the 248 is the ideal day boat for fishing, lunch cruises, and boat rides with his grandchildren. On our brief test run and photo shoot, her New England design heritage was apparent from all angles. I transferred over to her from our photo boat, a 22-foot Seaway Center Console, also made by Eastern Boats. She seemed happiest at 3000 rpm for a fast cruise of about 15 knots and took off at 4500 rpm, producing a ride of over 27 knots. Her helm was responsive, and she remained dry as I cut through a large wake from a passing boat. MoJo is powered by a single 175-horsepower Yamaha mounted on an optional transom bracket—which I recommend as it provides a more usable aft deck, further isolates the already quiet four-stroke, and provides for a swim platform with hinge transom door access. Her layout both above and below decks allows for plenty of seating, a full-size V-berth, and a Porta Potti plumbed to a dockside pumpout. A conventional marine head is optional. The helm station was well equipped with navigation and engine management readouts. A built-in footrest added to the comfort. Visibility was good in all directions, and her large sliding windows provided good ventilation. 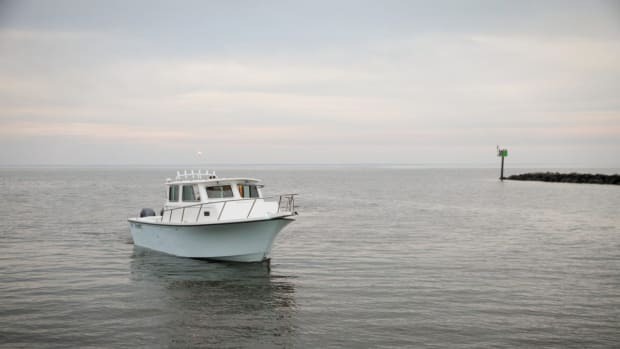 Parker, a family-owned and -operated boat builder in Beaufort, North Carolina, began building commercial fishing trawlers for use in the turbulent waters of the Outer Banks. 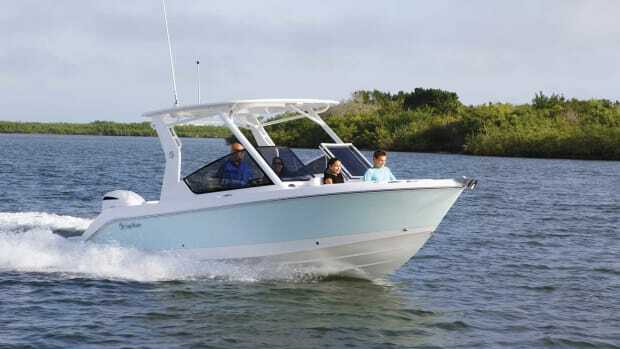 Though the company shifted focus to recreational fishing boats, its line, which has grown to include 25- and 28-foot cabin boats, still reflects its commercial fishing heritage. The “XLD” model of the Parker 2530 has an extended cabin that adds a small dinette to port and a compact galley to starboard. The interior is as spartan as the exterior, with a focus on simplicity, serviceability, and strength. The standout for me was the box-grid stringer system below deck level...I’ve not seen a more substantial construction method on any boat. At Central Marine in St. Petersburg, Florida, I met with Sales Manager Josh Person, who, by way of his computer screen, gave me a tour of Parker’s North Carolina facilities and explained the characteristics of the 2530 XLD. The standout for me was the box-grid stringer system below deck level, a full-length grid of marine-grade, fiberglass-encapsulated plywood. I’ve not seen a more substantial construction method on any boat. Additionally, the entire exterior deck is self-bailing and feels like concrete as you walk on it. I toured the 2520 XLD model in stock. With the exception of cabin length, it is identical to the 2530. The forward cabin is furnished with a large V-berth. Two center cushions are removable to a fully electric marine head. Nothing fancy here, but functional. 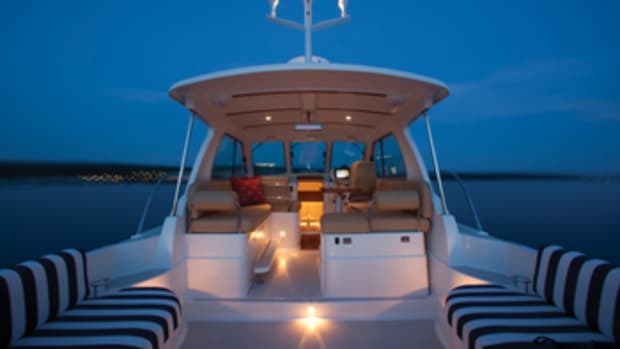 The helm station has dual helm seats and the boat is standard with full instrumentation including the electronic Yamaha engine panel and Garmin electronics. The cabin can be enclosed with a heavy-duty aluminum door or fitted with a canvas-enclosed open back. 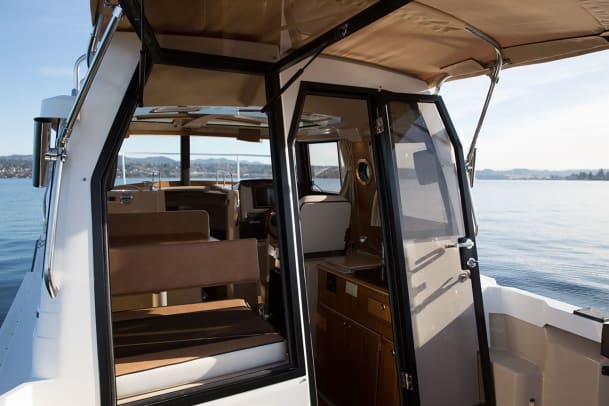 The aft deck can be fitted with a folding bench seat and an aluminum-framed soft top for shade. The boats are sold with Yamaha outboards mounted on an Armstrong platform. 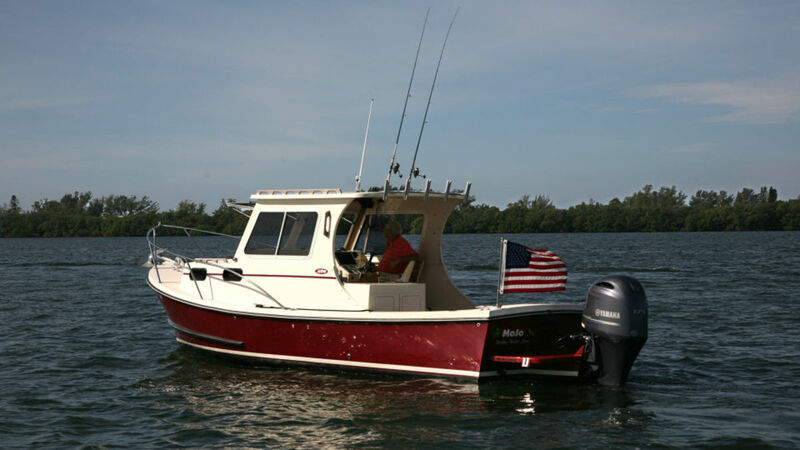 The 2530 comes in three power options: a single 300-horsepower motor, twin 150-horsepower motors, or twin 200-horsepower motors. 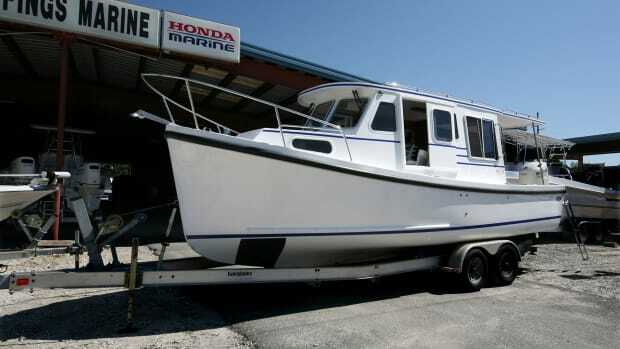 Introduced in 1979, the first Ranger Tug was 18 feet long and powered by an outboard inside of a motor well on the port side of the cockpit. It also had a sail rig. After an ownership change in 1999, the company expanded its line of tugs. Current models range in size from 23 to 31 feet, and both the R-23 and R-27 are outboard powered. I inspected the R-23 with Dan Callahan, sales manager at Edgewater Yachts in Bradenton, Florida. Surrounded by more conventional outboard boats, the R-23 stood out with her bright navy hull and matchless tug-like design. This latest version features a curved vertical windscreen shaded by a well-proportioned brow. Surrounded by more conventional outboard boats, the R-23 stood out with her bright navy hull and matchless tug-like design. Three large hatches in the aft deck reveal all the major systems. The components required for fuel, water, electrical and cooking are all contained in sealed compartments with appropriate ventilation and drainage. Flexible seating arrangements, a clever layout, a below-deck Pullman berth, generous use of ports and proper proportion all make her seem much larger than her actual size. If I’m being picky, one small improvement I might suggest is to rethink the edge of the bottom step into the forward stateroom, as it is not radiused and could be an ankle biter, although hardly a deal breaker. The overhead includes a number of skylights—some fixed, some operable. A large port behind the settee opens up to the aft deck. All of this glass enhances the feeling of open space in the salon. A careful inspection of specifications and pricing show that the R-23 is sold as virtually turnkey and includes standard equipment that is normally offered as an option on other boats. 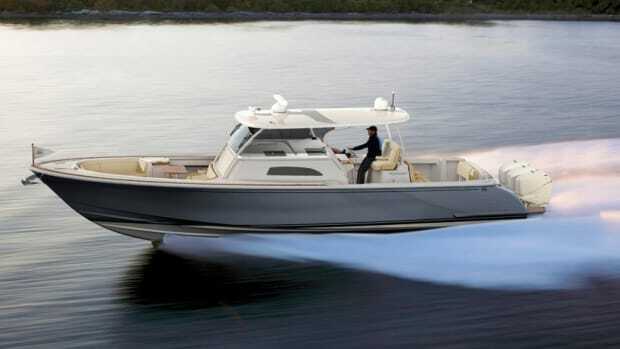 Note: The builder also offers a performance line called Cutwater Boats. According to the builder, Ranger Tug owners are a well-knit group of enthusiasts from around the country. The website tugnuts.com is a popular web hub where these owners share a great deal about cruising experiences, repairs and rendezvous. 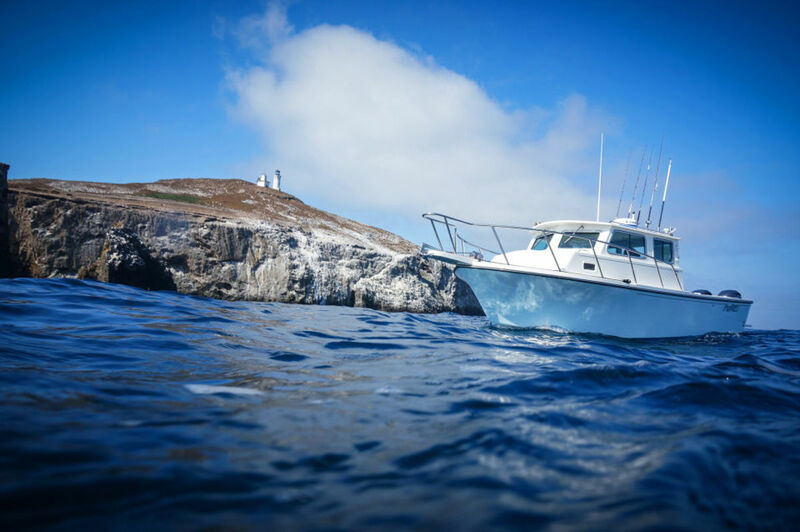 Designed in the late ’70s by James Rosborough in Nova Scotia, the Rosborough 246 might just qualify as the original trailerable trawler. Rosborough Boats built nearly 500 of these original models, which have home ports throughout Canada and the United States. As the firm transitioned to designing and building semicustom vessels for the Canadian Coast Guard and U.S. state and municipal agencies, Rosborough’s design has continued in the hands of a variety of builders. Rigorous sea conditions in its home waters of Nova Scotia influenced its design along workboat lineage and little has changed today. The Rosborough 246 is comfortable in a wide range of sea conditions. The Downeast-style semi-displacement hull with a center keel and a straight flat run aft combines performance and durability in a head sea. I inspected the latest model in Florida, where the boat’s owner touched on the logistics of trailering, launching and retrieving a boat of this size and weight. He recommends a ¾-ton pickup to handle the load. 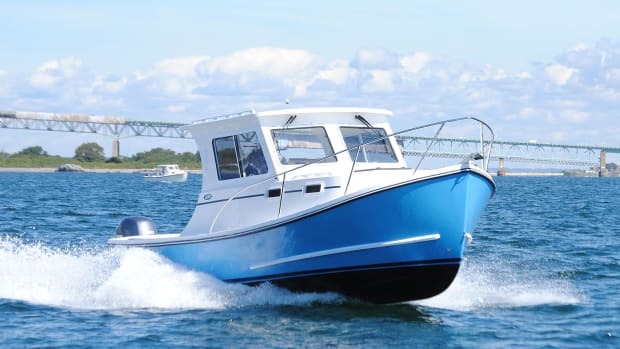 Rigorous sea conditions in its home waters of Nova Scotia influenced its design along workboat lineage and little has changed...the 246 is comfortable in a wide range of sea conditions. The high-profile cabin house provides a spacious salon, with large, tempered-glass windows and twin pilot doors for access to the foredeck. 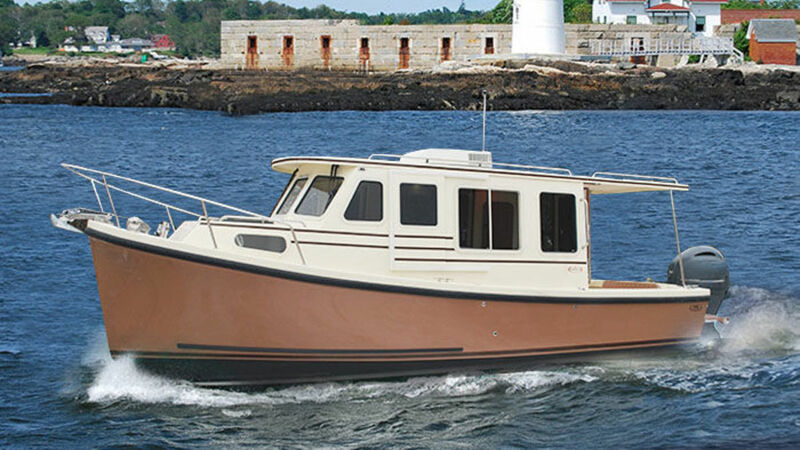 The latest Digby model offers an optional upgrade to a solid teak interior. The extended hardtop is a great place to store a dinghy, and provisions have been made to mount a manual lift. The 246’s trailerability, minimal draft and climate-controlled pilothouse are big selling points, but its greatest attribute may be efficiency. 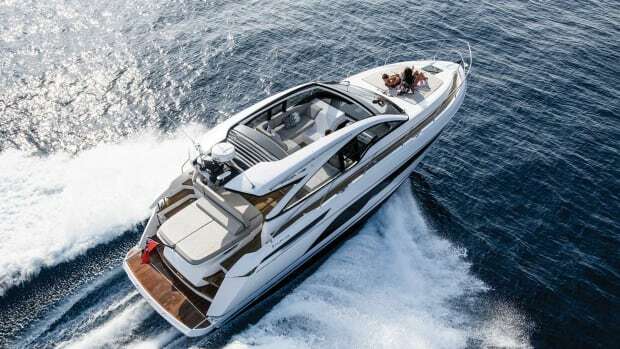 A standard 150-hp (or upgraded 200-hp) Honda Marine engine mounted to the hull maximizes aft deck space, permits a swim platform, isolates engine vibration, improves fuel economy, and contributes to a drier ride and better handling. The head on this boat was an optional composting toilet situated in the V-berth with privacy via the companionway door. One advantage here is more space dedicated to the salon, which always a plus. Rosborough Boats are sold factory-direct. This article originally appeared in the March 2019 PassageMaker Magazine issue. Comfort, performance and sheer lavishness are qualities often attributed to luxury automobiles, but today’s sport coupes and express cruisers can lay claim to them, too. They have powerful and efficient engines, elegant and modern lines, comfy accommodations and plenty of space for entertaining and socializing. Yacht designer Alberto Mancini puts a dynamic spin on Fairline’s new sport cruiser, the Targa 43 Open. 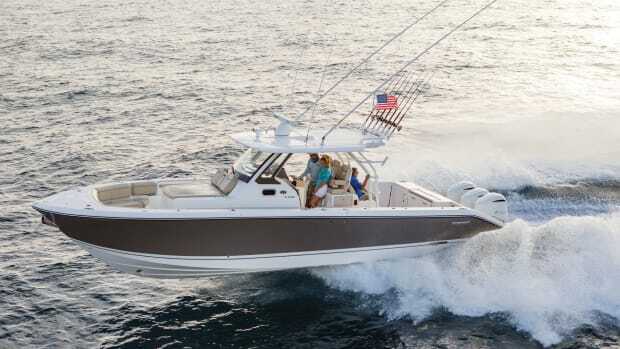 The 230CX from EdgeWater is designed to do it all, combining the attributes of a sporty day boat, coastal sportfish and cocktail cruiser.